In Spring of 2016, I attended Human Cities Conference in Beijing. During the three days of the conference, I teamed up with four Chinese students to venture out and explore Beijing Hutong’s urban green space by interviewing the residents about their gardening hobby. In Autumn of 2016, I joined Stanford Urban Studies Department and Human Cities Initiatives on 2-weeks field trip to Beijing to learn about international urbanization. We talked to urban planning experts, NGOs, professors, and many local residents to learn about this city. We used the Urban Observations Notebook to observe the city through the eyes of urban planners. For group project, my group did a project on the education of migrant children in Beijing. Both times, I asked myself, “Can I bring this program to Vietnam, my home country?” China and Vietnam share so many similarities. I think the educational model of Human Cities will work in Vietnam. A year later, I found a summer program in Vietnam that would host my idea. With the help of Stanford Earth Systems and Urban Studies professors, I developed an interdisciplinary environmental education curriculum for Vietnamese high school students. And in the summer of 2018, I executed my curriculum. In two weeks, I introduced to 10 Vietnamese high school students the fundamentals of climate change, ways and tools to vision a human-centric city, and immersive field work. The students used the Vietnamese version of Urban Observations Notebook to interview local residents and tourists of Hanoi. They learned about Hanoi’s transportation pattern, public space usage, and green space. 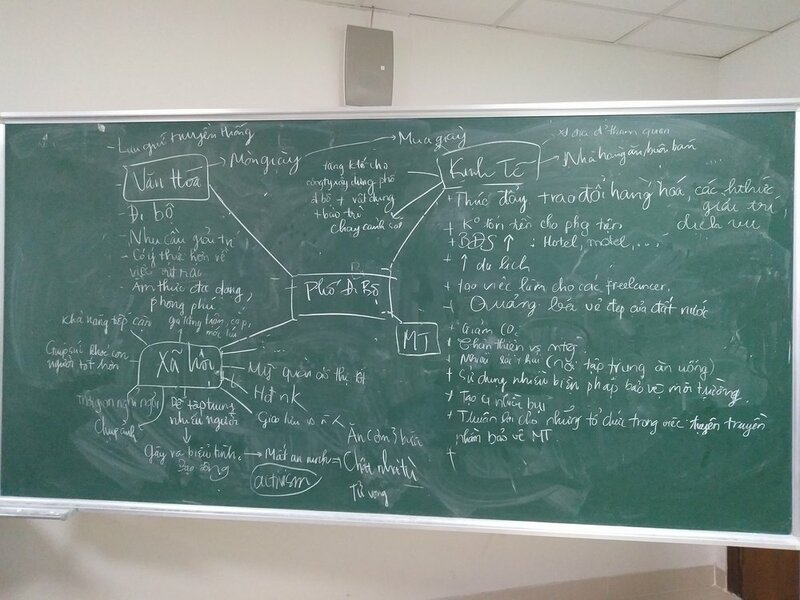 A student who was local to Hanoi told me after each field trip, “I never knew this about Hanoi!” They also delved into an urban problem of Hanoi by exploring the problem and presenting their solution to it. For example, to address Hanoians' demand for exercising space, clean water, and clean energy, a group proposed installing electricity-generating and water-filtering exercise machines at Hanoi’s signature Hoan Kiem lake. I was amazed by how successful the curriculum was. Even after the programs, the students still use the concept of 4 Pillars of Sustainability to apply for various environmental contests. Using the knowledge and skills learned from the curriculum, some students teamed up to run a Facebook campaign on environmental awareness in their home provinces. I'd love to have more chance to teach this curriculum again. Please contact me at tranl95 at stanford dot edu if you have any suggestions! Learning how to create and use a mindmap for the first time! Our first urban observation field trip in Hanoi! Our class had a field trip to GreenID, a renewable energy NGO in Vietnam, and heard an inspiring talk from Mrs. Khanh Thi Nguy (2018 Goldman Environmental Prize Winner from Asia). I also hosted a public workshop on urban observation (using Urban Observations Notebook) for around 30 people from all ages!